If you have a Facebook Fan Page, then you are probably wondering what are some easy ways to increase fans? You’d be surprised as to how much traffic your Facebook Fan Page gets each day! With 300 million Facebook users, plus Facebook Fan Pages are now crawled and indexed in Google search results, your Facebook Fan Page can easily be getting more traffic then even your long standing website! However, the problem with most Facebook Fan Pages is they are not optimized for maximum fan conversion. What I mean by Facebook Fan conversion is getting new visitors to your Facebook Fan Page to click the “Become A Fan” button – which of course, is what makes them become a new fan of your Page. One of the most effective ways to convert new visitors to your Facebook Fan Page into “Fans” is by building a custom landing page / landing tab. Each Fan Page has tabs long the top that represent different pages within your Facebook Page. With custom integration, you can have a custom made tab – and a custom made image on that page – that acts as a “Call To Action” to all new visitors to your page to become a fan. 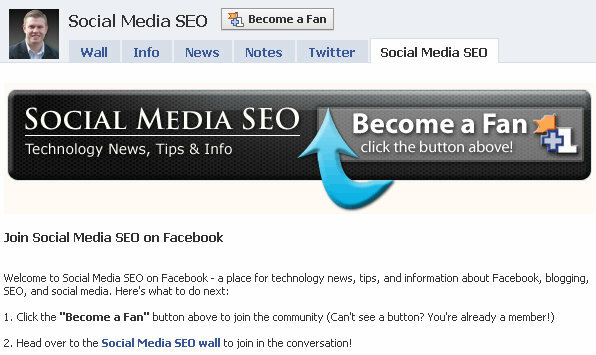 This is the custom call to action I’ve built for my own Social Media SEO Facebook Fan Page. Click here if you’re not already a fan. Once you click the link above, you’ll be taken to my Facebook Fan Page. But you should have noticed that instead of going to the wall tab of the page, you will taken to a “Call To Action” tab in my page. This “Call To Action” of course encourages all new visitors to become a fan. And for those that are already a “Fan” of my page, they will be taking to wall tab instead of the “Call To Action” tab. Having the “call to action” element on your Facebook Fan Page allows you to send all new visitors to this tab first – before they get to your wall. People are moving fast and browsing when they’re online. And if you send people first to the invitation to become a fan, then you’re much more likely to get that person to become a fan of your Facebook Page. Sending new visitors to your wall can quickly divert their attention away from the “Become A Fan” button, and they are very likely to leave without becoming a fan. We’ve been helping clients quite a bit lately set up custom “Call To Action” elements for their Facebook Fan Pages. And with great success as well! We don’t have any solid figures yet, but having a “Call To Action” landing tab will dramatically increase your “Fan” conversion rates. I have been reading a lot of Help Questions on Facebook as I just created a new "Page" for my business. From reading answers on the Help Page, I am not the only person that has had difficulty in creating, editing, finding and promoting my Page. I came across a couple of your answers, and you are sooooo facebook smart and informative. I liked your answers so much, that I also became one of your facebook fans. Thank you again for your "Facebook Smarts". Marian, . My facebook page is: . Hi Marian – thank you so much for visiting and reading our blog – it is truly and honor to me! 1) You could make your website more "socialable" by adding your Facebook Fan Box (an element of your Facebook Fan Page) to your website. 2) You could also allow visitors to share your website on Facebook with a Facebook Share button. This could dramatically increase traffic and attention to your website. 3) I would clean up your tabs on your Facebook Fan Page. You don't need all the tabs along the top since your Page is still relatively new with fans. The one element I would integrate is your "Notes". Notes on a fan page are the equivalent of you having a blog. I would post new articles about your business with photos, videos, and a lot content with keyword rich titles – especially since Google does in fact crawl and index the notes on Facebook Fan Pages. 4) Once your Facebook Fan Page hits 25 fans, you can then create a custom URL – learn how to do that here >> . Thanks again Marian for visiting and commenting here at Social Media SEO! Hi Marian – when logged in, go to your Facebook Fan Page > look under your Fan Page pic and you should see a link called "Promote with fan box" > click that link and follow instructions from there. You should be able to simple copy and paste code into your website. If you're still having problems, give me a call at 706-363-0335 and I can see if I can't help you quickly!